We’d love your help. 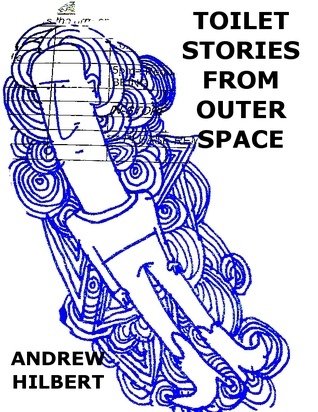 Let us know what’s wrong with this preview of Toilet Stories from Outer Space by Andrew Hilbert. What do Kim Jong-il, a San Antonio cowboy, and a polar bear have in common? What is the best course of action when one finds one's apartment infested with tiny little naked white men? How many ways are there to properly grease a donkey? Find the answer to these questions and more in this chapbook of 7 weird stories from Andrew Hilbert. http://hilbertheckl What do Kim Jong-il, a San Antonio cowboy, and a polar bear have in common? To ask other readers questions about Toilet Stories from Outer Space, please sign up. The good news about getting slightly obsessed with reading everything from someone who hasn't published a lot is that, unlike my obsessions with Stanislaw Lem or JG Ballard, reading everything is an achievable goal. In fact, soon I will be at the point where I'm picking things up as they come out. Actually, I take the whole thing back. I'm currently caught up on a couple of TV shows and waiting for their airing schedule is awful. I have set myself up for anticipation and paying slightly higher p The good news about getting slightly obsessed with reading everything from someone who hasn't published a lot is that, unlike my obsessions with Stanislaw Lem or JG Ballard, reading everything is an achievable goal. In fact, soon I will be at the point where I'm picking things up as they come out. Actually, I take the whole thing back. I'm currently caught up on a couple of TV shows and waiting for their airing schedule is awful. I have set myself up for anticipation and paying slightly higher prices for ebooks that just came out. Regarding this ebook, it's very short and the stories within it aren't always satisfying. Many of the stories fall under the "I had a thought for a scene so I wrote the scene" variety, so they don't have the beats of a story, but are always interesting. I found that sometimes an ending when I thought the story was only getting started made me actually think about the story. There's a mode that I find myself going to, not paying as close attention to the start of the story when I think there's more of it, so, when it ends after the beginning, when it isn't building to something more, I have to stop and think about what just happened, to consider whether what I just read was satisfying when the expectations are stripped away. Sometimes the answer is yes, sometimes it's no, but the exercise is worth the effort. Andrew Hilbert is a stone cold killer of a writer. I first read his exquisite novella, Death Thing, and was blown away. Now, this. The stories in this chapbook are of the same high quality and have the same slap-you-silly power. Read him now. Andrew Hilbert is a writer living in Austin, TX. Andrew Hilbert is from Long Beach, CA. He, along with three others, founded Beggars & Cheeseburgers magazine in Long Beach shortly before moving to Texas. It lasted three issues but in its short run it had over a hundred subscribers. In Texas, he began freelance writing for multiple companies and contributing articles to Austinist.com. He had a Andrew Hilbert is a writer living in Austin, TX. Andrew Hilbert is from Long Beach, CA. He, along with three others, founded Beggars & Cheeseburgers magazine in Long Beach shortly before moving to Texas. It lasted three issues but in its short run it had over a hundred subscribers. In Texas, he began freelance writing for multiple companies and contributing articles to Austinist.com. He had a short run as a columnist at Out of the Gutter Online and ran the blog The Cheesepaper. He was a fiction editor for Foxing Quarterly for three issues and co-founded an audio short story website, Slagdrop. Andrew and longtime friend and collaborator, Jack Arambula, are also working on a monthly comic series called The Weekly Weird Monthly. Andrew Hilbert's poems and stories have been in numerous journals and websites worldwide since 2009 with many more forthcoming.